When it gets to core of it, here is all you need to know about Kevin Kiermaier. By and large, none of us mind one cent of the Outlaw's big heist. We are jealous brood by nature. We read about the monopoly money contracts that are being passed out, and we shake our heads. The guy hit .216, and for that, he's a multimillionaire? The long-snapper? The backup quarterback? Really? But not with Kiermaier, not Goldfingers. We have measured Keiermaier, weighed him and tested his worth, and we find him completely fulfilling. He plays the game right. He hits a lot of doubles, and he takes even more of them away. He is what we want our Tampa Bay Rays to be all about, heart and hustle. Not many Tampa Bay Rays have made us nod our heads at him as often. He climbs walls. He covers gaps from the left fielder to the rightfielder. He leaves skid marks on the base paths. There are players in the game who play behind their numbers. Kiermaier is one of them. He hit .246 last year. When he had better health in 2015, he hit .263. But you look at the leather on his left hand, that glove where so many opponents' hits go to die, and you figure that if the Rays weren't going to pay him, well, the pitchers might take up a collection. Hey, these are the Rays. They rarely pay anyone, and as soon as the check gets fat, it's time to buy a plane ticket elsewhere. Ask Logan Forsythe. And David Price. And Ben Zobrist. And a dozen more. No one gets rich off of the Rays. Yet, Kiermaier is on the cusp of a fortune. The figures say he'll be here for six more years, and he'll make $53.5 million. It's a pretty rich stagecoach that he's holding up. He's a rich man on a poor man's baseball team. Still, the Rays recognized that that was chump change compared to the cost of losing Kiermaier. 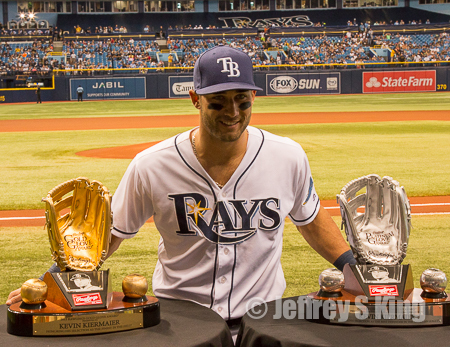 Few Rays can thrill their fans on offense and on defense the way that Kiermaier does. Few players put the fans at risk of missing something when they go to the restroom. He impacts the game like a great shortstop, like a dependable catcher. It's funny. Kiermaier was an afterthought as a Ray, an outfielder taken in the 31st round (941st overall, worth a whole $75,000 bonus). That's the forgettable territory, the territory where you draft a guy who will spend his life telling other insurance salesmen that he might have made it as high as AA. Kiermaier beat the odds. He simply outworked his teammates. He made the front office notice him. The Rays were hunting for outfielders in the 2010 draft. They picked Josh Sale first. Bust. They picked Drew Vettleson third. Bust. They picked Michael Lorenzen 10th. Bust. They picked Deshun Dixon 13th. Bust. They picked Chris Winder 27th. Bust. Finally, they picked Kiermaier. But not until they picked a third baseman named Nicholas Schwaner and a catcher named Matt Koch and a first baseman named Phillip Wunderlich. In all, it was the greatest collection of nobodies ever picked in front of a somebody. And that's a key thing with Kiermaier. Think of all the bonus babies who went in front of him. Think of all the high-priced free agents who disappointed. Kiermaier simply wouldn't settle for being less than an impact player. He kicked down the doors to this franchise. He made himself a bargain. Turns out, Scott hit that one solidly. In the coming years, centerfield belongs to Kiermaier. Maybe he won't win a gold glove every season. But he'll be a candidate. He'll leap and he'll dive and he'll run and he'll hustle. Yeah, in the end, he'll be wealthy. Odds are, he'll be worth every penny. I guess the law of averages says the Rays have to be right on at least one draft pick per year sometime. But not every year probably. Some years they miss on them all. Previous post: Can Gregory be the guy to make you care about USF?